Sony KDL-55NX813 review | What Hi-Fi? Comparatively small in its class, this dapper set doesn’t have 3D built in. Instead you have to buy the TMR-BR100 transmitter and matching glasses separately, and even after shopping around this will set you back around £200. Extra cost aside, having an extra extremity on your otherwise stylishly straight-edged TV isn’t ideal, regardless of how compact it might be. And what if you also have a Wii bar or Xbox Kinect? Suddenly that space on the top of your set is looking like prime real estate. 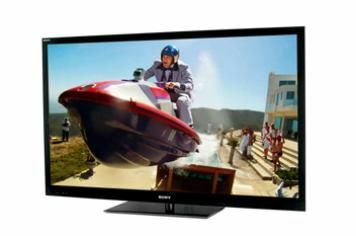 On the other hand, what it does mean is that those who don’t yet want to go down the 3D route can buy a telly now and know that it can be upgraded to 3D spec whenever they’re ready – and the good news is that the KDL-55NX813 is an extremely capable 2D display. Sony has long been the master of motion processing, and the KDL-55NX813 proves it’s still the case. Other TVs are capable of rendering the slow pans of Harry Potter and the Order of the Phoenix, but only the Sony has a truly convincing grip on the complex, unpredictable, fast-paced action. The edge LED backlight proves that it’s capable of producing impressive contrast levels, too, from punchy, detailed whites to deep yet revealing blacks. On top of all that, Sony’s already impressive line-up of internet services was recently bolstered by the addition of Qriocity, and while we’re not entirely sold on the music portion’s low-quality streams, the pay-as-you-go movie service has an impressive catalogue and excellent picture and sound quality. Of course, you can also get your HD fix via the Freeview HD tuner, and images here are just as vibrant and sharp as they are with other HD sources. Standard-def channels and DVDs are impressively upscaled, too. There’s very little noise, even in shoddy broadcasts, and colours successfully tread the line between vibrancy and over exposure. If you do decide to plump for 3D, you’re likely to be very pleased. Killzone 3 (definitely the best 3D game so far) looks awesome, with the Sony dragging you into the action with the kind of detail that significantly enhances depth, which makes it easier to judge distances – and spot your lethal enemies. Again, there’s impressive levels of punch, but as we’ve found with other TVs, the Sony suffers from a degree of crosstalk that some people will find tiring. Our only other gripe is that the KDL-55NX813 sounds a bit thin, but what really keeps the Sony at four stars is the presence of some bigger, better all-round competition from the plasma brigade..